Home / News / SEO Services / What is Mobile First index SEO 2018 And how does it affect SEO? Do you know what is this Mobile-First Indexing? Why Google is giving more importance to this new Search engine optimization update. If you are a blogger or your website then you must know about this Mobile-First Indexing topic. There's a lot coming in now that Google has recently introduced Mobile-First Indexing in user behavior trends in a recent development to make the web more mobile friendly. So today I thought, why not give people some basic information about what is "Mobile-First Indexing", which will give you answers to all the questions arising in your mind. With this, I will also discuss about some frequently asked questions. Above the Mobile-First Indexing, all the things related to it will be completely clear. 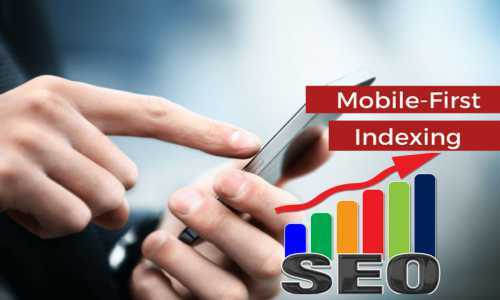 Then you will tell people about some of the SEO tricks that allow you to make your site very mobile Friendly and prevent ranking from decreasing, then without delay, let's start and know that after all What is Mobile-First Indexing. Everyday mobile users are increasing if we compare it with desktop traffic. Over half of all Internet users use smartphones and tablets. To see something on the internet, we do not have to waste time and we will see it quickly. This is because of mobile or smartphone more user-friendly. By 2020 end, will come to about 80% of global Internet traffic mobile. It is known that is giving a lot of importance on Google mobile phone. Mobile is the most demanded thing of nowadays. But only due to a mobile site of the event, all your issues are not lost. Yes, we can not deny that Mobile sites have become a cornerstone now, with content consumption and purchase, Mobile searches now people are getting a better buy decision, which is increasing their buying interest. but What is the matter arises our site is ready for Google's mobile-first indexing? Because if not, there will be further and further in both traffic and traffic in the coming years. What is Mobile-First Indexing seo 2018? Mobile-First Indexing means a site that is very mobile friendly, users have the ability to view it from their mobile, and that's why Google indexes these sites more quickly. Keeping users' consumption, Google found that most users prefer to browse the Internet from their mobile phones. In such a situation, the site is mobile friendly. Therefore, Google also indexes such sites as soon as possible. As well as ranking holds more importance for the mobile version of indexing your website. If you monitor the crawlbot traffic of your site, you will find that the Smartphone Googlebot traffic me has increased greatly and pages cached versions are often the mobile version of the page. This is called "Mobile-First" because it is not only a mobile-only index: For example, if a site does not have a mobile-friendly version, then the desktop site will also be indexed. But the lack of mobile-friendly experience does not so put a negative impact on your site's ranking, and a better mobile experience where on the site, it promotes higher rankings, even if searchers desktop Well. You must be thinking that the phrase "Mobile-First" would be like a reference where the mobile version is being considered as the primary version of the website. So if your mobile and desktop versions are both equally - for example, if you have to optimize your content for mobile, and if you are using a responsive design then these changes cannot put a big impact on your site's performance in search results, but this will represent how Google will represent Thinking about your website content and how to prioritize crawling and indexation much more. What is Mobile Marketing and why is it necessary? And the mobile site was seen as an "alternate" version in the case of a site, so Google is encouraging webmasters to be a separate mobile site (m.domain.com) for which it is implemented Switchboard tags (this represents the existence of mobile URL version using a special rel = alternate tag) Google probably will not crawl and cache more mobile versions of your pages, but now display directly in mobile URL mobile searchers. The reason behind the primary version of the desktop version is that the desktop site can be prioritized by SEOs and by marketing teams. At the same time, the website was treated at the end of a comprehensive version that used to contain full content, structured data markup, hreflang (international tags), the majority of backlinks, etc. The mobile version contains tighter content, and also The same level of markup and structure can be done, but in large quantities, it can not be found backlinks and external attention. Google's Mobile-First Indexing announcement is very big. This will keep changing our content Creation and its optimization in the coming times. These are an idea of using content will also change. But finally, what is the big question and brought it? An easy as a brief description is that Google will index a website desktop version before indexing it, or evaluate it according to relevance and rank it before its mobile site. Why? That's because according to Google (as well as a lot of other studies), the mobile traffic has surpassed the traffic in Google. As we know that Google's entire business and foundation are a simple The principle has stood on: Users should be provided as soon as possible and accurate information. For example, when you are found in birds India "angle, as are some of the search, the search engine will find all information as a well-curated with you very well. It means perfectly optimized images, with fast page speed, and text's formatting, whereby the user does not have problems with the eye while reading it. For this reason, Google shows that the material is fast and effective. In order to fulfill this demand, Google can not only index the desktop sites where the majority come from traffic mobile. Additionally, the user experience will be very poorly with search engines and they will be forced to find other search engines, which do not want Google ever. To do all this, Google is constantly developing developments in its SERPS. In addition, Google is making its platform more user-friendly. But this is not a change that is called "mobile indexing" because Google is not completely switching to just the Mobile Indexing, which means that it is only "Mobile-First" Indexing, that means you have to be a blogger As a matter of fact, the desktop version of your site does not require scrapping or slacking altogether. You should take special care of the mobile version of your site, because for now more algorithm, you have to have mobile-optimized your site for more organic visits. But there is a good news that not all people need to make too many changes in their sites. Some sites do not have to change anything because he is completely well. It depends on the current architecture of your site, your site may be right in this aspect. So let's go ahead and learn how your site mobile-first indexing. According to Google, if your website is responsive or otherwise similar to desktop And in mobile Versions, then there is no need to do anything else or otherwise, in that it is assuming that you are happy with your Mehjooda current ranking). With this, if your site is also a fully responsive site, you have to pay attention to whether or not your mobile page speed and loading time are okay, it will have to be more prioritized. Also, images and other dynamic elements will also have to be properly optimized for the better mobile experience. Note that in the Mobile-First Indexing, the content that has been collapsed or hidden in tabs etc. Visual content (which is already due to space limitations in comparison to the same) will not be treated differently, it is because this type of screen to be better mobile practice in real estate management. Structured data:- The structured data markup should be used.URLs that is seen in the mobile pages within the structured data, it is necessary to have a mobile version of that URL. Also, do not add unnecessary structured data if it's specific to your page Then there is no relevance to the content. Note: - According to the official guidance, "equal" is given more importance that instead of "identical" you can optimize your mobile titles even more. For short character counts, but be aware that it includes the same information and relevant keywords of include. Hreflang: If you're using rel = hreflang for internationalization, then your mobile URLs' hreflang annotations should always point your country mobile version language variants and, with me, desktop URLs desktop should point towards the versions.Note: - hreflang attribute always specifies the language of the linked document these attributes are used only when the href attribute is set. Social metadata: Must include OpenGraph tags, Twitter cards site and other social metadata in both mobile versions and desktop versions. Search Console verification: If you have verified your Web site to Google Search Console, then add the mobile version along with verifying it. Switchboard tags: If you have mobile switchboard tags implemented now, then there is no need to change your implementation. Keep this same. Keep in mind that your mobile and the rel = canonical and rel = alternate link elements within the desktop versions. Eliminate such as Pinching, zooming, squinting, and all other annoying Functions that you will never have to pay, at the time of using mobile. For example, the image you can not even see when you want your mobile Turn in landscape mode. This is a type of sign that this website mobile Not responsive. On the other hand, in mobile-friendly sites, Can see related issues. Mobile-friendly sites allow your content To dynamically change when you are viewing it in a mobile browser. But does not mean that your content is responsive. This means that you can not see the desktop version of that site in mobile, but instead, you can only see a functional mobile site in which the page elements are still going to be impacted. In today's time, many devices are coming in different shapes and sizes. In this case, make all devices mobile friendly is not easy, because of their size and the ratio should be taken into consideration. Whether the tablet or mobile, smartphone, are so many devices. Mobile-friendly is not the answer to all this. Did mobile pages in mobile-first indexing be added to a different mobile index? Only one index in the Mobile-First Indexing (the same which Google is now using)it happens. Due to the change in it, It has not created a new "mobile-first index", nor does it create a separate "mobile index", where the "desktop index" is still active, but when you add it, how does this content change in the index? He made part of some selected sites of the project. All these sites have been selected manually, by analyzing their site and see their site structure, even for certain keywords, but in the coming years, mobile-first indexing will be given more importance. So Google has announced to all webmasters that make your sites mobile optimized as soon as possible so that they will benefit in the coming time. 2) will Google use only to determine mobile site? Mobile-First means that the site mobile version will be considered as a primary version when it comes to knowing the rankings of sites. But some such situations also come Where the desktop version is also considered, for example, if your site does not have a mobile version then That's why you can find mobile search results and desktop search results in Google ranking. There are many different results to look at. Where Google first focused on desktop search results for ranking, mobile search is emphasizing results right now. 3) Will Google pay more attention to the rankings of the desktop site? It does not matter whether Google will focus on the desktop site or no difference, but it is clear that will focus more on mobile than the desktop site. I think that they will give preference to traffic accordingly, it means that if traffic is coming from the mobile then the mobile version will be given importance, and if the desktop is coming from the computer then more attention will be given to the desktop site. Ranking will also be determined accordingly. 4) What if my site does not have a mobile version then? If you do not have a mobile version of your site and your desktop version is not mobile-friendly will index your content, but they will not be ranked better than other mobile-friendly websites And will put a negative impact in its overall ranking, which is not a good thing for your site. 5) How do Google's new change ranking factors and strategy move forward? In the future, they are going to affect many ranking factors and strategies. According to researchers, Mobile-First Indexing is a type of indication that Google is now traditional Links and HTML will depend only on top of URLs for ranking. That is to say that Google is now moving away from the URL system and thinking about an API importance based on "entities" (ie structured data), giving them more importance. 6 ) What will be treated responsive sites and different mobile sites is no difference between it? 7) What this update does affect my ads/content / etc, will change the approach to service on your mobile site? If your current perspective shows any changes in ads like slowing ads or a bad user experience, then it is important that you take note of this. If you want to hide some of your mobile site content to save space in your site, then it is not really a problem because the content is treated at the same rate as the article on that page. It is fully loaded when visible, as long as the content is crawlable or accessible. What is the future of Mobile-First Indexing? Mobile traffic is the largest traffic on the Internet in the coming days. It will not come, it has not come and is going to stay for a long time. Since most users currently prefer to use the data in mobile. In this case, with the help of Mobile-First Indexing, those sites are showing more in search results which provide a better experience to users. If a website is not very reactive and fast, so they can see a decline in its ranking in the coming days. Therefore, all new construction webmasters must comply with all terms of mobile-first indexing for your site. That's why it is better than you make your site better than others in this Mobile-First Indexing which will be very useful for you in the coming time. I like people expect to have mobile-first indexing? And I hope you have understood that mobile-first indexing Do. If you have any doubts about this article in your mind or you want some improvement in it then you can write down comments on it. With your thoughts, we will get a chance to learn something and improve it. If you have found this post-Mobile-First Indexing in your language or you have got to learn something, please share this post on social networks such as Facebook, Google+ and Twitter to show your happiness and curiosity.